The 24-year-old shot one under par in a solid final round to claim first place, with Jarryd Dillas seven shots back in overall second and Robert Vallis and Will Haddrell a further shot behind tied for third. “It was a good win. I wouldn’t say I expected it, and it was a challenge to get, but it’s a great achievement,” Phillips told the Sun. 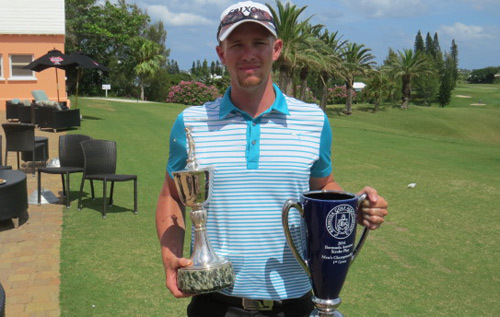 It was the first Amateur Stroke Play victory for Island Games gold medallist Phillips, who kicked off the tournament with a superb two-under 69. A second-round 73 followed before carding 77 in a third round made trickier by the weather. It meant he began the final round with only a slender one-shot lead over Dillas. “In the third round, the conditions were a little bit tougher, it was a little bit windier out there, and I shot a six-over par. Phillips finished five over for the tournament, with a gross score of 289. 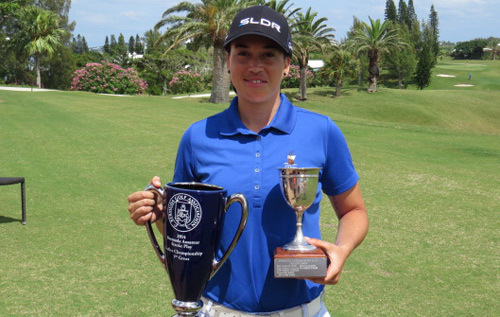 In the Ladies’ Championship, Tariqah M Walikraam, 25, won by eight shots from Katrin Burnie. Walikraam carded rounds of 79, 94 and 88 to finish 48 over par gross. Linda Down was third — 10 shots behind the champion. Elizabeth Parsons was leading the field by three shots after the first two rounds but school commitments meant she had to withdraw from the tournament. Arnie’s still got it! But which golfer is Port Royal bound?